At 7 months of age, Hallie and Noah were lucky they were so cute. Their curiosity got them into constant trouble. One day the family came home to find Noah’s collar missing and the buckle and D-ring mysteriously lying on the ground. When the fifth new collar had disappeared, we discovered in the grass evidence of nylon collar chunks having been ingested by a puppy. Sure enough, Hallie had been gnawing the collars off her brother’s neck, chewing them into 2-inch pieces, and swallowing them completely. 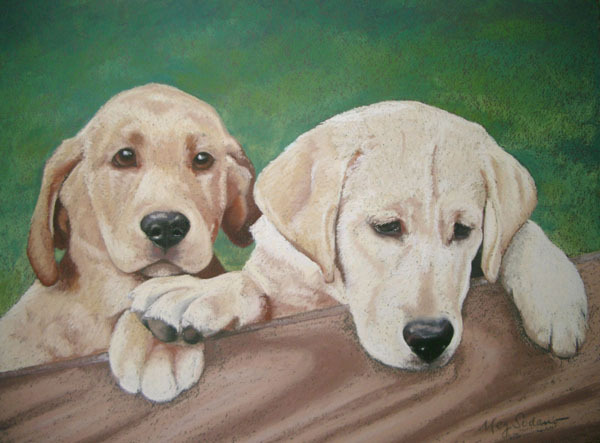 As the inseperable duo grew into adult dogs, they turned into the best companions a family could have. 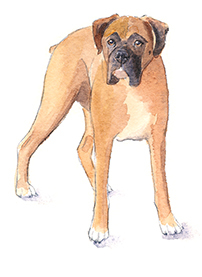 Hallie was known for her lovely, velvety ears and she proudly welcomed many compliments on her lady-like personality. Noah was a “love puppy.” When he sat near you, he would lean against your legs or rest his head on your lap and look up at you with a smile. While they are missed immensely, their spirits run free and find sticks in the woods around their Connecticut home.